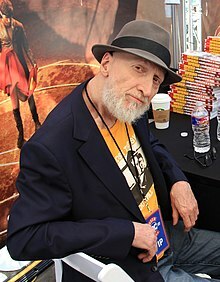 Frank Miller (born January 27, 1957) is an American writer, artist and movie director. He best known for his film noir-style comic book stories including Ronin, Daredevil: Born Again, The Dark Knight Returns, Sin City, and 300. He is one of the most widely-recognized and popular creators in comics, and is one of the most influential comics creators of his generation. Miller was born in Olney, Maryland, on January 27, 1957, and raised in Montpelier, Vermont. Because of his interest in comics, Miller moved to New York as a young adult to work as a comic book artist. Miller released his first graphic novel, Ronin, in 1983. Miller later wrote other graphic novels including the Dark Knight Returns and 300. Miller moved to Los Angeles and worked in Hollywood during the 1980s and 1990s, writing the scripts for Robocop II and III. Not happy with the films, Miller stopped working in TV and movies until 2005, when Miller worked with director Robert Rodgriguez on the film, Sin City. ↑ Webster, Andy (20 July 2008). "Directing 'The Spirit,' Frank Miller Has the Challenge of Bringing a Will Eisner Comic to Life" – via NYTimes.com. ↑ 2.0 2.1 "Frank Miller Essay -- Biography". www.123helpme.com.